Step 1 Add the potatoes to a saucepan of boiling water and cook for 15 minutes, until just tender. Drain well, then cut the potatoes in half, or into quarters if they are large. Step 2 While the potatoes are cooking, cut the artichoke hearts in half lengthwise and pat dry with paper towel. Heat half the oil in a non-stick frying pan over medium-high heat. Place the artichoke hearts in the pan in a single layer, cut side down, and cook for 2-3 minutes, until golden brown underneath. Turn and cook for 1 minute, until browned on the other side. Transfer the artichokes to a serving bowl. Add the potatoes and keep warm. Step 3 Heat the remaining oil in the frying pan. Sauté the bacon and onion over medium-high heat for 1-2 minutes, then add the red pepper and cook for a further 1 minute. 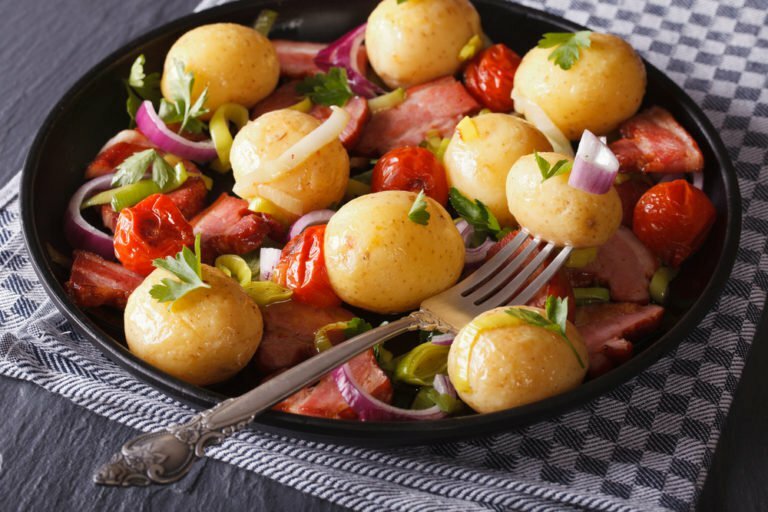 Using a slotted spoon, transfer the bacon, onion and red pepper to the bowl with the potatoes and artichokes. Scatter the rocket on top. Step 4 Return the pan to the heat and add the balsamic vinegar and wine. Tilt the pan to swirl and mix the vinegar and wine with the cooking juices. Pour over the salad, season with salt and freshly ground black pepper, then gently toss until well combined. Sprinkle the toasted pine nuts over the salad and serve. This salad is a perfect partner for lamb or chicken, or can be served as a starter before a light main course.